Page Academy is a co-educational private school. At Page, we promote a positive learning environment and a personalized approach that sets the stage for extraordinary learning experiences. 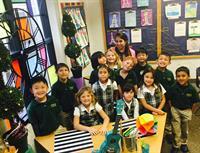 Fine Arts & Music Class at Page Academy!